I had some good scrappy time over the weekend. It was nice to sit in my room, football on in the background and just get busy. I had spent Friday evening perusing a bunch of challenge blogs for inspiration. I even found a few I knew I could participate in, so I was ready to roll Saturday morning. Two in particular are ScrapFIT and Scrapbookers Anonymous. I've been working on pictures of spring 2006. Some are events, some are moments, but man, just looking at them brings back all the memories. This first one is for two challenges. ScrapFIT Weekend Warmup #22, use STARS. Stars are a fairly easy one for me. Having two boys, stars go nicely on many LOs. All of the PP and embellishments are by Fancy Pants. The stars at the top and bottom of the page are rub ons. The bottom one I outlined in black pent to make it stand out more. The orange triangle border at the top of the PP is a Fiskars border punch. 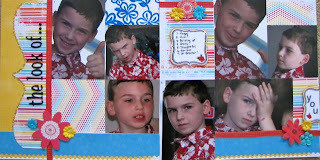 I also used this LO for Club CK Issue Challenge #3, use stickers in your journaling. This next one is using a mask with ink and a stamp, which is something I've never done before, as suggested by Scrapbookers Anonymous and Scrap Our Stash. The Journal spots are a stamp I use often, but they actually have lines in the middle. I used a mask so the middle would be blank and I could write the way I wanted to. They aren't perfect, but pretty good for my first try and good enough to use. It's a small part of the LO, but it made a difference to me. Seeing as tomorrow is a snow day for my husband and children, I may have some time to sneak back into my room again. I already have some photos and PP's laid out on my desk! What a fun layout! I love the bright colours you have used. And love all the "looks". I have photos of my sons like that. 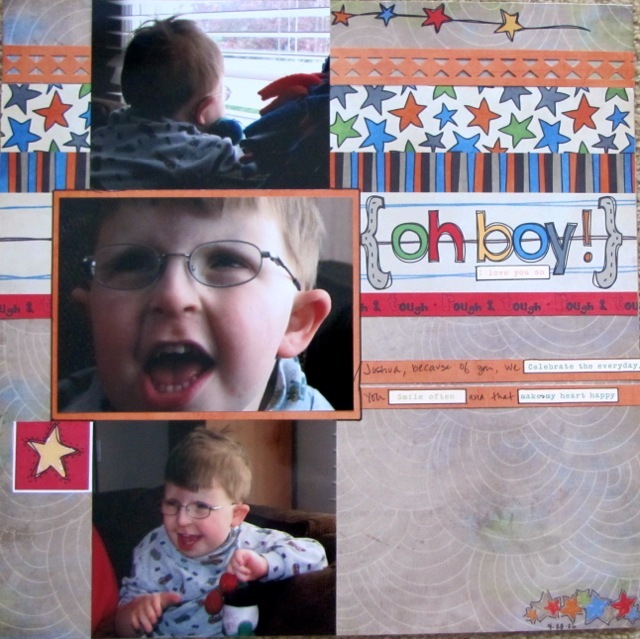 lol....Thanks for playing along with us at Scrapbookers Anonymous! Very nice layouts. I really like the stars in the right hand corner. Very creative! I love your IC LO. Love, love, love the title! Great layouts! Love the 2-pager and such great colors and picture arrangement. Thanks for joining in the fun at Scrapbookers Anonymous!!! Aw, this is too cute! Love how you incorporated stars...it's awesome! Thanks for working out with us at ScrapFIT! isn't it fun to try new technique?? I love trying things and seeing the results. this is a great 2 pager..and I love the papers you used on the first lo. Really cute. Loving this!!! Thanks so much for playing along with Scrapbookers Anonymous!!!! It's so full of life!